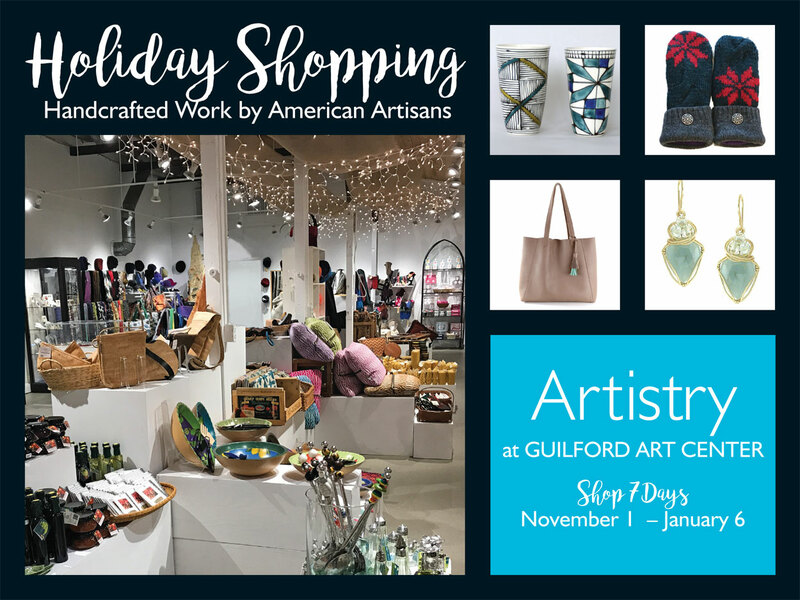 Guilford Art Center announces its annual holiday shopping event, Artistry: American Craft Shopping for the Holidays, which takes place November 1, 2018 through January 6, 2019. One-of-a-kind, fine craft by artisans from across America will be featured, including ceramics, glass, jewelry, homewares, fiber, ornaments, accessories, toys, specialty foods, stationery, leather goods and more. The Shop at Guilford Art Center doubles in size during Artistry, creating a bountiful selection of fine craft work for shoppers to peruse. This year features many new artists, both local and national, as well as new work by established artists. New items are added throughout the course of the show, so visitors will always have fresh shopping experiences every time they visit. Artistry also offers visitors a variety of shopping experiences: personal shoppers are available for advice and gift-giving ideas; a registry makes gift-selection easy; and businesses can take advantage of personal shoppers and discounts for employee holiday gift-giving. Proceeds from Artistry benefit the exhibiting artists and Guilford Art Center’s educational and community programs. Hours: Monday through Friday 9am-5:30pm, Thursday 9am-8pm, Saturday 10am-5:30pm and Sunday 12-5pm. OPENING RECEPTION: Thursday, November 1, 5-8pm, free and open to the public. Kick off the season with this festive event, including beverages, snacks and good cheer! MEMBERS’ WEEK—SPECIAL MEMBERS’ BENEFITS: Nov 1 -November 7: Members receive 15% off all items and 10% off throughout the rest of sale. Become a member at any time and immediately receive this benefit. JEWELRY & PROSECCO RECEPTION: Thursday, November 29, 5-8pm Enjoy a night of sparkle and fun! Sip glasses of prosecco and Aperol cocktails while viewing the wide range of jewelry made by American artists for all tastes, budgets, shapes and sizes. Enjoy giveaways and delicious treats. Event sponsored by Mionetto. Free and open to the public. OYSTERS & WHISKEY MEN’S SHOPPING NIGHT: Thursday, December 20, 6-8 pm Need to do some last minute shopping? We’re here to help – especially our male customers. We’ll serve fresh oysters and whiskey to keep up the energy levels, as well as have staff on hand to help with shopping and wrapping. Free and open to the public. Guilford Art Center is located at 411 Church Street, Guilford, Connecticut (exit 58 off I-95). For more information call 203-453-5947 or contact www.guilfordartcenter.org.